What happens after five college friends who hang out every Thursday start a typical college journey together but only four will finish that journey? Steven Manchester’s The Thursday Night Club is what happens. 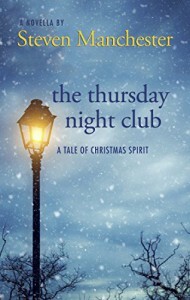 The Thursday Night Club takes you on an exhilarating emotional journey of grief, mortality & the fight to keeping living. You journey along as Izzy, Kevin, Ava, Jesse & Randy whom all love practical jokes take a hard hit. As these college seniors lose one of their own to a car accident. They gain an understanding on life that is invaluable. Out of darkness comes light. The light their now deceased friend was shining ignites a fire that will change them forever. As The Thursday Night Club grieves they come to realize their lost friend was living out the person they had all hoped to become in the future. They all wanted to live a life that meant more than just simple existing. They wanted to make a difference now not later. Steven Manchester takes you along with them as they figure out the secrets of life. This novel left me wanting a sequel; which is rare. Steven Manchester however, made me want to send him an e-mail demanding answers. The Thursday Night Club created an impassioned hope for greatness with Jesse, Izzy, Kevin, Randy & Ava that made me want to know exactly where their lives took them. It seems to be Steven Manchester’s gift to create friends instead of characters.